There were plenty of stand-out trends at New York Fashion Week this season -- but perhaps the one that stood out most was how designers used their platforms to shine a light on the current tumultuous political climate. Milly channeled her "fractured" and dispirited energy into a somber fall line, Vogue editor-in-chief Anna Wintour -- along with others -- stood proudly with Planned Parenthood and Prabal Gurung brought the room to a chilling halt with his powerful ode to women. Now, more than ever, it's evident that fashion is so much more than meets the eye. Vogue editor-in-chief Anna Wintour was one of many NYFW guests who wore a "Fashion Stands with Planned Parenthood" pink button. Milly named her Fall 2017 collection "Fractured," saying, "During the time I was designing this collection, the world changed dramatically. The elections left me feeling defeated, especially as a woman." The unsettling music at the show also reflected the somber vibe of the collection. Christian Siriano featured a simple, yet powerful, message on his runway with this "People Are People" tee. Public School turned heads with red "Make America New York" hats, seemingly directly responding to Donald Trump's "Make America Great Again" slogan. You can buy your own for $65 at PublicSchoolNYC.com. Prabal Gurung ended his chilling show (an undeniable ode to strong women) with a finale walk to the sound of John Lennon's "Imagine." 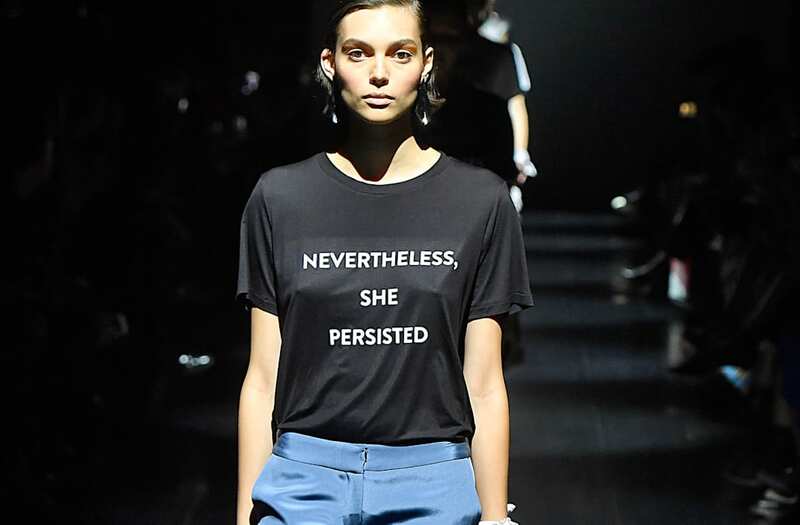 Models wore T-shirts with messages, including "Nevertheless, she persisted," "Feminism with a bite" and "Our minds Our Bodies Our Power," to name a few. Marchesa concluded their show with with the lyrics "I demand a better future." Mara Hoffman enlisted the co-chairs of the Women's March to speak before the models hit the stage. "We work peacefully while recognizing that there is no true peace until there is justice and equity for all. Hear our voice," Tamika D. Mallory said. Naeem Khan gave the room goosebumps as a gorgeous model took the catwalk, alone, in gold headdress and gold gown, walking to Maya Angelou's poem "Human Family." "We are more alike, my friends, than we are unalike," the poem concluded. Much like Siriano, alice + olivia by Stacey Bendet gave guests a simple, yet important, reminder. Anniesa Hasibuan's show featured an all-immigrant cast of models wearing hijabs. "Difference is not something to be afraid of—it's something you should embrace," she affirmed. Tommy Hilfiger and Gigi Hadid showed their support for the the #TIEDTOGETHER campaign at the TommyxGigi Show, with models tying these bandanas around their wrists. The campaign aims to make "a clear statement of solidarity, unity and inclusiveness."